Have you ever picked up a 16ft or 20ft board and stared down it? Often you’ll notice twisting and cupping on a longer board. Not the case with WindsorONE Trim Boards; industry-leading finger joining and edge gluing ensure you get one of the most straight, tight and true trim boards on the market. Patented application process using proprietary DuraPrimeTM primer saves time prepairing & painting, featuring the brightest white primer on all six sides. The Tru-Core® penetration technology takes five EPA registered decay and insect control preservatives and transports them to the core of the board, binding them to the wood fibers. Tru-Core® fully penetrates heartwood (unlike other outdated technologies). Heartwood typically makes up 30% of a board. WindsorONE Tru-Core® is applied in the USA. Other treatments are typically done overseas (New Zealand, Chile, China) due to the expense of operations & handling requirements needed to meet USA Environmental, Air Quality, Health & Safety standards. WindsorONE+ Protected is resistant to many effects of weathering thanks to the new Weather Resistant System (WRS) additive. 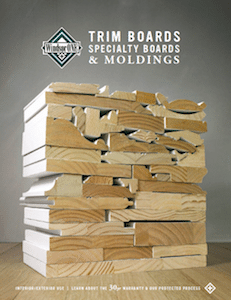 WRS provides you with a board that reduces the potential for cracking, swelling, and other weathering damage. Furthermore, the WRS improves the coating performance and breathability of your trim.